In this video Mark Donovan of http://homeadditionplus.com reviews SnapPower’s new “Safelight” product, an LED powered child-friendly nightlight with sliding outlet covers. Besides providing smart and energy efficient pathway night lighting, the SafeLight also doubles as a tool to help prevent children from electrical shocks. 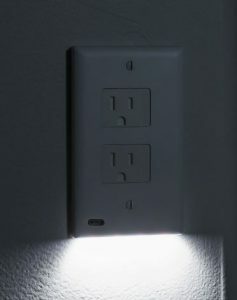 SnapPower came out a couple of years ago with a unique new product called the “Guidelight”, an electrical outlet faceplate cover with three built-in LEDs and an ambient light sensor that enables it to also function as a nightlight. Now SnapPower has just introduced its latest product called the “SafeLight”. It offers all the functionality of the original “GuideLight” product, but with the added feature of having integrated self-closing socket faceplate covers. Thus, not only is it ideal for functioning as a night light, it also protects children from accidentally electrocuting themselves. Like the “GuideLight” electrical outlet faceplate cover, the “SafeLight” costs pennies a year to operate. It draws only a few milliamps of current and consumes less than 0.2 watts of power, a small fraction of what a traditional incandescent night light fixture requires for power and operating costs. Unlike the traditional nightlight, the SnapRays “SafeLight” is also not bulky or prone to breakage, and does not tie up an electrical outlet. Moreover, with its built-in it self-closing socket faceplate covers it dramatically reduces the risk of accidental electrical shock, both for children and adults. The SnapRays “SafeLight” looks very similar in shape and size to any other electrical outlet faceplate cover. At the time of this writing, it is available only in white. However, I expect that like its predecessor, the “GuideLight”, it will eventually come in a couple of other shades, e.g. light almond and ivory. The “SafeLight” is also available in two styles, duplex and décor. The “SafeLight” does not require batteries or a power cord to operate. The two power extractor prongs located on the back of the unit pull power directly from the electrical outlet to power the three LED lights. The LED lights produce 3 lumens of light, which is the equivalent of traditional night lights. When the integrated ambient light sensor detects low area lighting the “SafeLight” outlet cover’s LED lights automatically turn on. When sufficient area lighting returns to the room, the LED lights automatically turn off. The three integrated small LED lights are located on the bottom side of the unit, making it ideal for providing pathway night lighting. The installation of the “SafeLight” is fast and easy. No electrician is required. After turning off power to the electrical outlet at the main circuit breaker panel, use a common screwdriver to remove the old electrical outlet faceplate cover, slip the “SafeLight” over the electrical outlet, and secure it in place with the screw that comes with it. When finished, turn power back onto the electrical outlet and the “SafeLight” is operational. Note: When installing the “SafeLight” faceplate cover, just make sure that the two power extractor prongs on the back of it slip over the electrical outlet screws when positioning it in place. At the time of this writing, the “SafeLight” costs $17 when purchased in single unit quantities from their website. When purchased in quantities of five or more, SnapPower offers them at a reduced unit price. Though this pricing may seem high, it is important to keep in mind that the “SafeLight” is replacing a night-light and child electrical socket covers. In addition, with its very low power LED power consumption you’ll recoup the cost of the product over the long haul. SnapPower states that its LED lights are projected to last for 25 years. So if you have small children, and/or are in the need for a new nightlight or child electrical socket covers, you can’t go wrong by taking a close look at SnapPower’s “SafeLight” product. I’ve already installed one in my home and I don’t have children. For more information on them visit SnapPower’s website.